IT’S A BIRD! “Lumiere Claire,” A 16-by-18-foot lantern created by Pam Rindo, was part of last year’s New Year’s Eve parade in downtown Eau Claire. Art and business may seem like very different realms, but finding success in either of them requires hard work, creativity, and the ability to market oneself successfully. This goes double when artists are businesspeople trying to support themselves with their creative endeavors. UW-Eau Claire Continuing Education’s Artrepreneur program was conceived as a way to teach members of the Chippewa Valley’s burgeoning artistic community strategies to build their businesses, find funding, and connect with each other. Risseeuw, who previous managed social media at UW-Eau Claire and now has a similar job for the Minnesota Orchestra in Minneapolis, acknowledges that it can be a struggle for artists to balance time spent on social media with time spent making art. However, he said, with the right strategies a few hours a week can help grow an artist’s business. So which social media platforms should artists be using? Unsurprising, considering its ubiquity, Risseeuw recommends Facebook: People of every demographic are there, and artists usually already have personal experience there. Other platforms may vary based upon the kind of art an artist creates: For example, he said, visual artists may be best served using visually oriented services such as Pinterest and Instagram. Another local marketing professional, Erin Trowbridge, will also serve as an instructor at the Dec. 6 workshop. 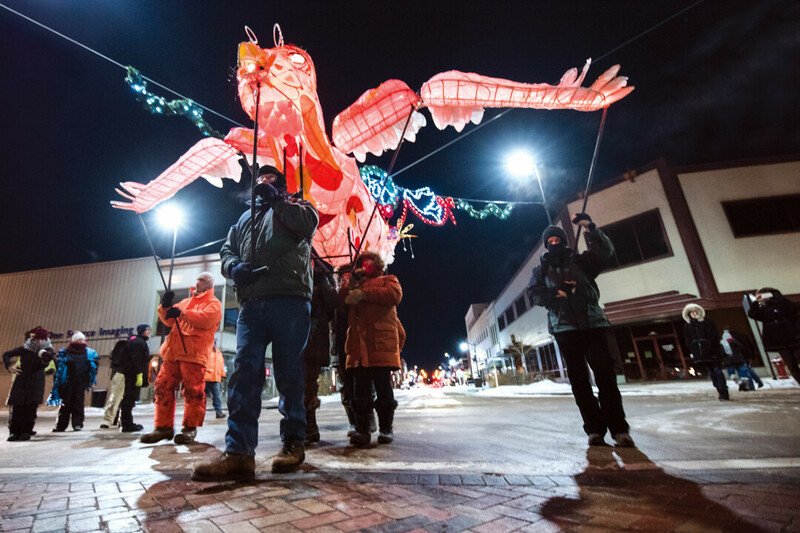 Eau Claire artist Pam Rindo – you may have seen her enormous, lighted Phoenix during last year’s New Year’s Eve parade in downtown Eau Claire – has attended several of the prior workshops. “The Artrepreneur program offerings seemed like the perfect opportunity for me to pursue some new goals,” she said. For example, previous sessions have taught her about what art galleries and businesses are looking for as well as the ins and outs of artist-in-residency programs. “Bringing people together of varying backgrounds and experience levels has also been a bonus,” Rindo added. This kind of networking is an important goal of the program, Moe explained. It’s been particularly helpful for her husband, Andrew Johnson, who now gets together weekly with artists he met through the Artrepreneur program. In the spring, four more Artrepreneur workshops are planned, all of them facilitated by artist CV Peterson: “Career Planning and Time Management for Creatives” on March 19, “Business Basics and Recordkeeping for Artists” on April 16, “Pricing Your Work” on May 21, and “The Artist Portfolio and Statement” on June 18. “Marketing and Social Media for Artists,” the latest workshop in UW-Eau Claire Continuing Education’s Artrepreneur program, will be 10am-4pm Thursday, Dec. 6. The fee is $39. To learn more, call 715-836-3636 or visit ce.uwec.edu/programs/artrepreneur-marketing-and-social-media.